Very good training and facilitator. I would recommend it to all. Boston is a major economic and financial hub and has a history of attracting the cream of the professional world to be a part of their corporate diaspora. Boston is renowned for its tradition of encouraging new and upcoming entrepreneurs into the world of business over the years and the city has the right infrastructure to support upcoming ventures. The number of corporate and IT start-ups in Boston have been on the rise leading to the establishment of a number of e-learning options. The exponentially growing employment market of Boston contains numerous challenging opportunities for professionals seeking to carve out a niche for themselves in the corporate world. In this highly competitive landscape, to help professionals stay relevant, KnowledgeHut offers a number of online learning opportunities for beginners and professionals alike, and CSD Certification in Boston is well-suited for individuals choosing to become a certified scrum developer. The e-learning modules Certified Scrum Developer Training in Boston are aimed at exposing the students to the concepts and techniques of software development in a scrum framework. The CSD Training in Boston is also a useful certification for professionals looking to add to their existing professional repertoire to enable them to stay ahead of their peers. The course in certified scrum developer provided by KnowledgeHut will definitely transform you into a valuable asset for your organization. 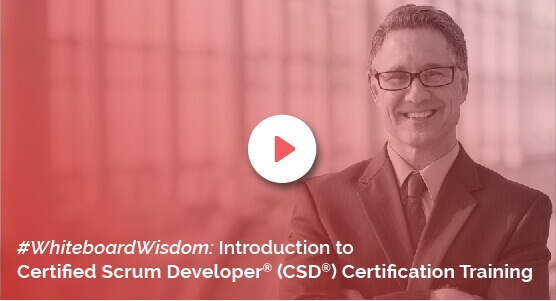 The CSD Course in Boston provides comprehensive online training to provide candidates with the expertise to stay ahead of the curve with respect to skills as a certified scrum developer. The intensive training provided to candidates ensures that they will stay highly competitive in their work place and allow them to expertly navigate through issues that may arise in the course of programming. The Certified Scrum Developer Certification by KnowledgeHut brings you close to world-class training at a reasonable price. The CSD Course in Boston comes equipped with intensive training that will allow you to pass exams on the subject with relative ease. KnowledgeHut courses are equipped with world class faculty, an interactive learning environment and vast resources that can be easily accessed.